Asparagus densiflorus is an extremely versatile perennial, evergreen plant that can be used as a groundcover or container plant in full sun or light shade. Although there are many striking and beautiful South African Asparagus species, most of them have horrendously large or sharp spines. A. densiflorus has only very small, hardly noticeable spines and is an excellent garden plant. 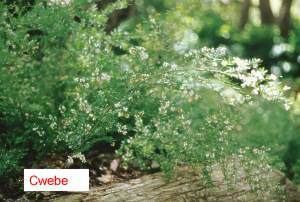 Asparagus densiflorus is a scrambling, slightly woody plant with upright or trailing branches up to 1 m long. The appearance of the plants varies enormously and has led to the naming of a large number of cultivars or forms. The best known forms belong to the so-called emerald ferns of the Asparagus densiflorus 'Sprengeri' group. These plants form large cushions with long, arching stems more or less densely covered with dark green, needle-like leaves. 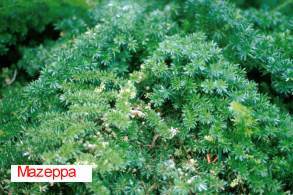 The plants of this group can be used as groundcovers in shade as well as in full sun, or in large containers or hanging baskets. The cultivars 'Cwebe' and 'Meyersii' form more upright plants, particularly 'Meyersii', which looks very different, with its compact cat's tail-like fronds. Asparagus densiflorus flowers are small, most often white or pale pink and are very sweetly scented. The flowers are not very noticeable, as they are half hidden by the foliage and do not last long. They flower for about two weeks during the summer season, in South Africa as well as in the Northern Hemisphere. The flowering of the plants can be rather erratic, with the plants having a good flowering year on average only once every three years. 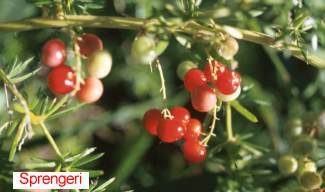 The small flowers are followed by showy bright red berries, which each have one large black seed in them. The berries are attractive to birds and may be spread by them. Asparagus densiflorus is not threatened. Asparagus densiflorus grows mainly in the coastal areas in the Eastern Cape and KwaZulu-Natal and in southern Mozambique, in a wide range of habitats, from coastal dunes to open rocky places or woods. It can be grown in USDA zones 9-10 and is hardy to -7°C (20°F). The genus name of Asparagus is thought to be derived from the Greek Asparagos for the cultivated asparagus and is possibly derived from 'a-'= intensive and sparassa = to tear, referring to the sharp spines of many species. The species name of densiflorus refers to the way the small flowers are densely packed along the stem of the plant. The earliest record of a South African asparagus is an illustration from 1686, while plants from the 'Sprengeri' group were introduced into cultivation as early as 1888. They are now grown all over the world and have proved hardy, drought tolerant and even fairly salt tolerant plants which can be used as garden plants or for cut foliage. The South African Asparagus species are related to the European Asparagus species and have a botanically very interesting structure. The so-called leaves are not true leaves at all, but are actually cladodes and are thought to be modified branches, while the spines are formed from modified branches or from modified leaves. 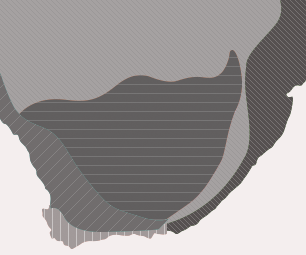 There are about 69 species in southern Africa, possibly 30 to 40 in tropical Africa and also some in Asia. They are widespread and common but are not often collected because of the short flowering period and the presence of the spines. The berries are eaten by birds, such as weavers, white-eyes, thrushes, bulbuls, barbets and robin-chats. Asparagus densiflorus is used in traditional medicine in South Africa and is a popular garden plant with many cultivars. One other South African species that is widely cultivated is Asparagus plumosus, which has flat, feathery short stems and used to be found in almost every bunch of cut flowers as foliage. Some of the South African Asparagus species are used as vegetables, and many are used for medicinal purposes. The berries cause only low toxicity if eaten. When the berries are crushed, skin irritation is minor, or lasting only for a few minutes. Asparagus densiflorus grows in most soils and is fairly drought tolerant, but does much better in soil which is rich in organic matter and is watered regularly. To rejuvenate the plants, they can be cut back after flowering. At this time a thick mulch of compost can be spread around the plants. 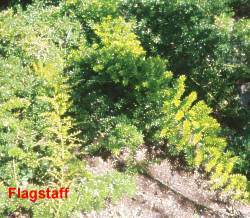 Asparagus densiflorus 'Sprengeri', 'Flagstaff' and 'Mazeppa' are excellent as a groundcover, especially in full sun. 'Sprengeri and 'Flagstaff' form long, arching branches of up to 1 m in length and can reach a height of 60 cm, while 'Mazeppa' forms a very compact dark green mat and looks very attractive in containers as well as on sloping garden walls. When these three cultivars are grown in shade they become long-stemmed with a wide distribution of the leaves. When grown in full sun, the plants become much more sturdy and dense. Asparagus densiflorus 'Meyersii' is known under a variety of names, i.e. 'Myers', Asparagus meyers, Asparagus meyeri, with the common names of cat's tail asparagus or foxtail fern. It grows to a height of 60 cm with long, soft branches arising from a central point to form a very ornamental plant, looking equally good in a container, as a feature plant or in a mass planting. It looks best when grown in shade or semi-shade. Asparagus densiflorus 'Cwebe' is a more upright version of 'Sprengeri' with very graceful, upright, arching fronds with long needle-like leaves. The young fronds are a very attractive copper colour. This is the only cultivar that does not like sun and should be grown in light shade. The plants have extensive root systems with fairly large tubers, which are used in nature to provide food during long periods of drought in summer. They can be readily propagated by separating the tubers in fairly large clumps, or by sowing the seed in spring or early summer. The seed should be removed from the fleshy berries, placed in a suitable sowing medium in a warm spot or with bottom heating of about 25°C and kept moist. FELLINGHAM, A.C. 1955. New combinations and a complete list of Asparagus species in southern Africa (Asparagaceae). Bothalia 24: 205-209. GREEN, P.S. 1986. The correct name for Asparagus sprengeri. The Plantsman 7, 4: 249, 250. JESSOP, J.P. 1966. The genus Asparagus in southern Africa. Bothalia 9: 31-96. 1998. Wild gardens: new releases from NBI (Asparagus cultivars). Veld & Flora 84: 67.